What are the Benefits of Choosing Organic Bedding? If you are sensitive to chemicals or tend towards allergies, you may find that an organic mattress provides you with a much more comfortable and peaceful sleeping environment. Organic sleep products such as organic bedding and organic pajamas are free from many of the chemicals used in most "regular" mattresses, which can cause irritation or other health challenges for people who are sensitive. Natural or organic beds can give your body the maximum opportunity to rest and rejuvenate without additional stress. Why should you buy an organic mattress as opposed to a traditional non-organic mattress? There are many reasons, and we will talk about those, but for now let's talk a little about the three types of organic options you can find in mattresses on today's market. Organic innerspring cotton mattresses are manufactured from a combination of organically derived cotton and organic wool. These mattresses consist of three basic layers: organic cotton and wool layer on top, metal innerspring coils in the middle, and organic cotton and wool layer on the bottom. This style of mattress is ideal for anyone who enjoys sleeping on his or her stomach or back and needs firm support. 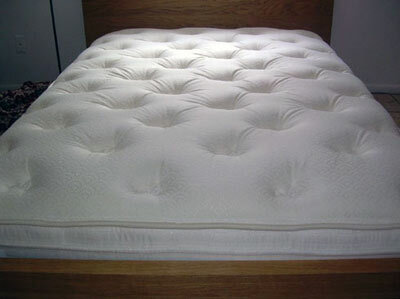 The organic innerspring cotton mattress is the more affordable of the these choices. Organic latex mattresses are similar to the organic cotton mattresses, but with one major difference that sets them apart. The middle layer consists of organic latex instead of the metal coils. The top and bottom layers are the same, consisting of an organic cotton and wool combination. This style of mattress appeals mostly to side sleepers and to those people who desire a firm, but softer support while sleeping. Latex mattresses are known for helping to relieve pressure points, which means you'll feel better and experience less pain each morning. Latex mattresses are great for anyone who is dealing with chronic pain, and they usually will retain their springiness for a number of years. Latex is also resistant to dust mites, making it a good choice for people with allergies. Wool mattresses are made like cotton futons, and provide a firmer support than most latex mattresses, and yet have more breathability and give than cotton futons. They are often placed on a slatted platform bed that has latex on the slats to provide extra cushioning. Wool is naturally resistant to mold, mildew and dust mites, and studies show that it helps people to sleep more soundly. Wool also helps the body maintain a comfortable temperature in all seasons. It is a bit more difficult to find certified organic wool mattresses especially in the United States, however there are other options such as wool mattresses made with Eco Wool batting. Eco wool is said to be very clean, free from toxins and well tolerated even for people with severe chemical sensitivities or allergies. Some wool textiles which surround the wool mattress are certified organic, and these usually cannot be laundered. Some types of non-organic or oranic wool are washable. That's the most basic explanation of the three types of mattresses manufactured with organic materials. Sometimes the verbiage used to market organic mattresses can be confusing, and so it is helpful educate yourself ahead of time with good information on what's available so that you can make the best choice of mattress for your needs. Are there other materials used in the making of a mattress that's labeled organic? Yes, some manufacturers will use kapok filling in their futons, a silky soft fiber that is found inside of the nut of the kapok tree. Kapok is hypoallergenic, lightweight, and helps the body regulate temperature. Kapok is harvested and produced using low impact, environmentally friendly methods. Organic hemp futons are another safe and nontoxic organic mattress solution. Hemp futons are more difficult to find, but provide heavier insulation that cotton futons. Organic futon mattresses are another choice available on today's market. These mattresses are constructed much in the same way as the ones listed above except they are not typically as thick or as durable, depending of course on the style and brand you choose. A futon mattress that's labeled organic is manufactured from organic cotton and wool materials and can have either an organic latex core for support or has individually wrapped metal coils inside the cotton and wool layers for support. The organic wool used in these mattresses is naturally flame retardant so there is no need to treat the mattress with harmful flame retardant chemicals - no PBDEs! Organic vs. Natural - What is the Difference? Consumers need to be aware that there are manufacturers who produce mattresses that are labeled organic but really aren't. The only way a product can be labeled as absolutely organic is if all the materials used to make that product were derived, grown, or raised without the use of any chemicals, hormones, pesticides, or fertilizers whatsoever. The term natural simply means that natural materials are used to make the product, but that during the process of manufacturing, the use of chemicals is permitted. Pesticides, hormones, and other chemicals may also be used to produce the cotton, wool, or other natural material for the product. Always check with the manufacturer to see if substances like formaldehyde, synthetically derived substances, flame retardant chemicals, polyester, plastic products or glue was used in the manufacturing of the mattress in question. The answer might surprise you! Get a straight answer or move on to another brand of organic mattress. Did you know that latex is naturally biodegradable? It's a natural material derived from rubber trees, so it will, in its natural form, go back into the earth and not harm the soil or the water supply. Latex will naturally repel dust mites, bacteria, mold, and other allergens that can sometimes cause people to have allergic reactions or simply not sleep well for no apparent reason. Mattresses produced from all organic materials can be recycled and made into something new again! The organic materials and all natural materials available today can actually replace the chemically laden materials used for years in mattresses, mattress pads, bedding, and pillows. There's really no reason these days to sleep on anything that contains chemicals, if you so choose. More mattress manufacturers are offering the organic mattress products to consumers now in response to the green movement and the heightened interest consumers have in whole, natural, and organic products across the board. This is excellent news for those who desire to create a cleaner and healthier home! Online retailers are the most obvious choice when it comes to finding these products. There are a few actual stores, depending on your geographic location, who are beginning to showcase and offer mattresses manufactured from organic materials, so be sure to call ahead and ask if they have anything displayed in their store that you could see. What's the Best Organic Mattress? Which type of organic mattress do you like the best?